Mansfield to Palterton Goods Way Bill. Glynn Waite. valley with milk collections being made daily and throughout the Second World War, parcels and passengers were also moved from here for Palterton and Sutton Scarsdale. The station however was not in an area with a high population. A branch line was added at a later date possibly around the 1920’s to supply and move coal from Ramcroft colliery by the Ramcroft Colliery Company owned by the directors of the Staveley Company (Closed October 1966). This branched off after the station and towards Glapwell and into the bottom of the colliery yard. Also towards Bolsover colliery were the sidings for the Byron brick works or the Palterton Brick and Tile works, the locally made bricks etched with either ‘Byron’ or ‘Bathurst’. The bricks were loaded onto the rail trucks at the sidings which were at the bottom end of the works. Due to the closure of Ramcroft colliery 1966 and the closure of the brick yard in the 1970’s this line ceased working and was closed 1976-1978. Palterton with the line flooded; These were taken c.1931, just after passenger services were withdrawn. Photographs, maps and tickets from Glynn Waite with thanks. The station plan is dated 19th February 1884, and signed by John Noble, the General Manager of the Midland Railway. The line to Glapwell was opened on 11th November of the same year. Note, however, that the station is included, even though it did not open until 6 and half years after the date on the plan! Carr Vale Brick Yard Sidings. Bathurst Brick and Tile. My collection. 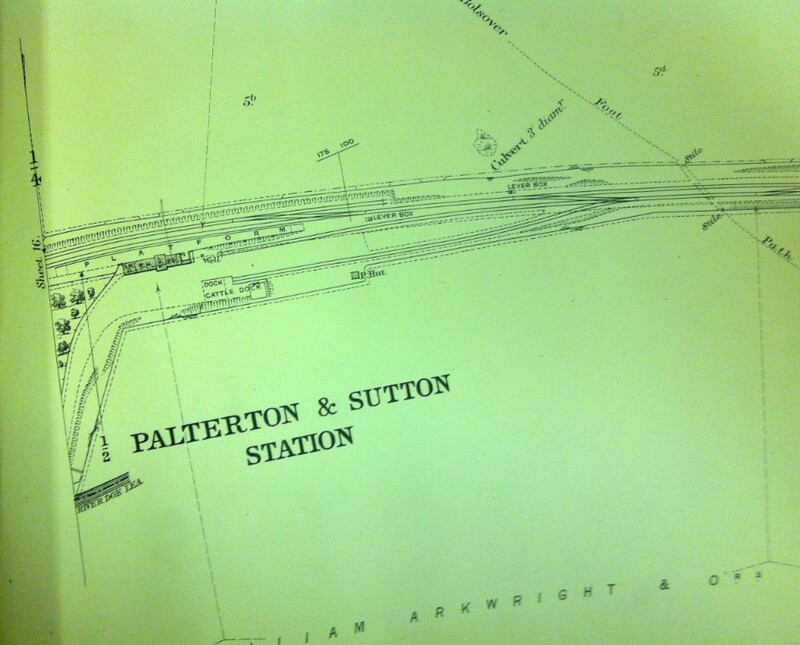 Palterton & Sutton Station 2 Chains Plan. Glynn Waite.